Seriously...are you not into trains? I'm going to do my best here to give an accurate and descriptive account of what happened yesterday. That was a total beat down. Hard to really describe it any other way. The first half was pretty much the most perfect half Michigan fans have seen out of their Wolverines in at least a couple of years. Before Scott Frost and Nebraska even knew what was going on it was 20-0...and Michigan didn't let their foot off the gas until after halftime when the score was 39-0. Nebraska is a disaster offensively. The Nebraska OL vs Michigan DL matchup was one of the most lopsided I've ever seen. And we just played Western Michigan and SMU...both of which played better up front than the Cornhuskers did yesterday. Something is fundamentally wrong in Lincoln. You don't go from what Nebraska had before to what they are now overnight. Frost definitely has his work cut out for him there. For Michigan, I don't care how bad Nebraska was, this is what you do to a team like that. I'm sure some Michigan fans will use how bad Nebraska was as an excuse for the blowout...I don't care. This is how games like this are supposed to go. No one expected Nebraska to be this bad, but they proved yesterday that things are very off...and Michigan was a buzzsaw. Nice to be the hammer instead of the nail against a program like Nebraska. My best of the game was the running game. Karan Higdon, after missing last week vs SMU, looked back to full 100%. His 12 carries for 136 yards and a touchdown all came in the first half. Nebraska, which was only giving up an average of 115 rushing yards per game, gave up 131 in the first quarter...thanks in large part to Higdon runs of 46 and 44 yards on his first 3 carries of the game. Tru Wilson and Christian Turner both saw plenty of reps throughout the game and looked impressive thanks to a much improved offensive line that really seems to be coming into their own as the season goes on. Also worth noting here, backup QB Dylan McCaffrey showed everyone his playmaking ability with that 75-yard run (which was called back) and some pinpoint passes. His stat sheet wasn't indicative of how good he looked. His 56-yard TD to Ronnie Bell was a great throw. This one is easy. The John O'Neill officiating crew was atrocious. 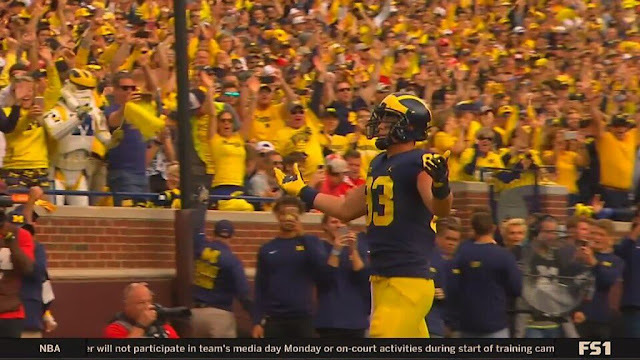 A few missed PI's in the first half...a ton of questionable calls, non-calls and delayed calls in the second half had Michigan fans booing for much of the second half of the game. I didn't help that this was the #JTwasshort crew from the 2016 Ohio State game. These guys don't seem to like Harbaugh that much...and I think that feeling is mutual. Also, Khaleke Hudson's targeting penalty and the snap that sailed over Patterson's head were unfortunate low points in an otherwise flawless game. This is a new section I've added this week because of one play that happened in the 2Q. Adrian Martinez dropped back near his own goal line to pass and was hurried by Aiden Hutchinson who tipped the pass back to Martinez who tried to pass the ball forward again while in the air falling incomplete. At first this was called a legal play...but was quickly overturned a ruled an illegal forward pass. However, what made it so odd was that the second illegal pass took place in the endzone, which by rule, is a safety. So the way the play was scored officially, was a pass from Martinez to Martinez for -11 yards and a team safety. You can watch a lot of football and never see something like that again. Michigan is a different offense when they can run the ball effectively. They can do that with almost any back, but Higdon is on a different level. It easy to see why he's the starter. He just has an extra gear that Wilson, Samuels and Turner don't have yet. Michigan will want to get Evans back soon, though. 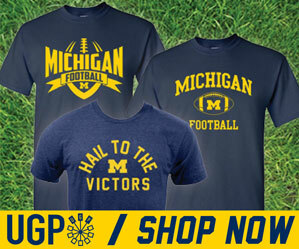 The Higdon/Evans combo is a powerful punch of the Michigan offense. I wanted to go with Gary or Winovich or Ross or Glasgow or...well...anyone from the Michigan defense here, but my I can't go against the heart of this defense. Devin Bush is just a freak of nature. His speed, toughness and vision are a powerful combination that can truly change the direction of a game. No question, the Peoples-Jones' 49-yard touchdown return was the highlight in a game full of highlights. The spin move was really the topper if we're being honest. If it weren't for that, we'd be talking about Will Hart's punting here...which was crazy impressive. His first two punts of 57 yards were nice, but the real gem was a 64-yard bomb in the 4Q that came to rest at the Nebraska 5 yard line. A game like this, when seemingly everything is clicking the way you want it to, comes back to head coaching. Scott Frost's comments from two years ago about how his UCF team "out-hit" Michigan en route to a 51-14 beat down, stuck with his Harbaugh and Michigan this week and I think it showed yesterday. Now, we just need to bring this level of aggression to games against Penn State, Michigan State and Ohio State.